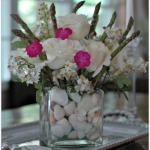 I go through a flower craze every spring. I cannot wait to see what pops up in our yard and surrounding areas and allow the bold colors and variety of textures to inspire some creativity. 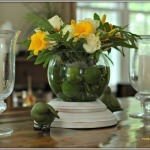 Since so many spring flowers make a brief debut each year, they often make their way into my home so I can enjoy them. I enjoy adding an element of surprise to my flower arrangements but I’ll be honest, this method doesn’t always work. Some things just don’t wind up looking as good they do in my head. Plus, my kitchen typically looks like a disaster after I have tried many different combinations until I find the right one. But when it works, it’s oh so worth it. Today I want to share some of my latest creations and the method behind my madness. Let’s start with asparagus. But I thought we were talking about flower arrangements? We are! 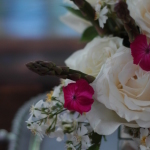 But it doesn’t always have to be flowers … truthfully, even weeds make their way into my flower arrangements occasionally if they are pretty enough! With the assistance of floral foam (which I bought at the Dollar Store) and wooden skewers, asparagus spears easily fit into this arrangement. I put the sharp end of the wooden skewer into the base of each spear and inserted the dull end into the floral foam at the base of the vase. 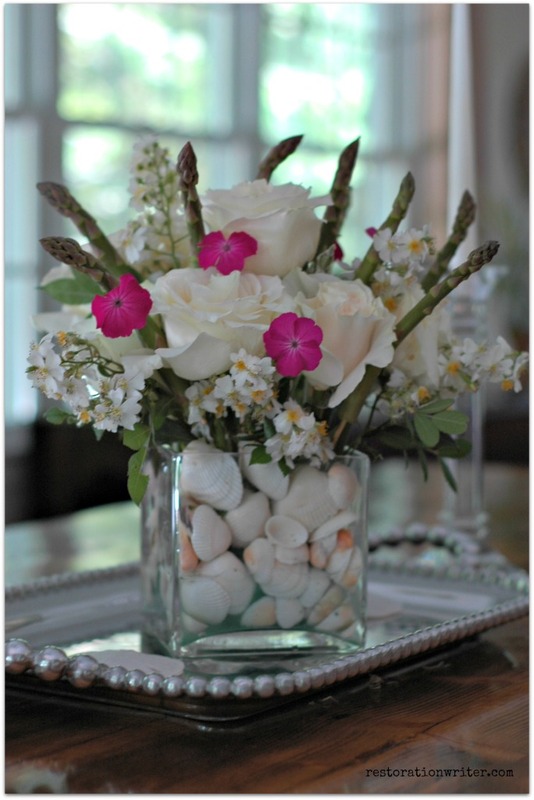 I camouflaged the floral foam with some seashells from a nearby beach. 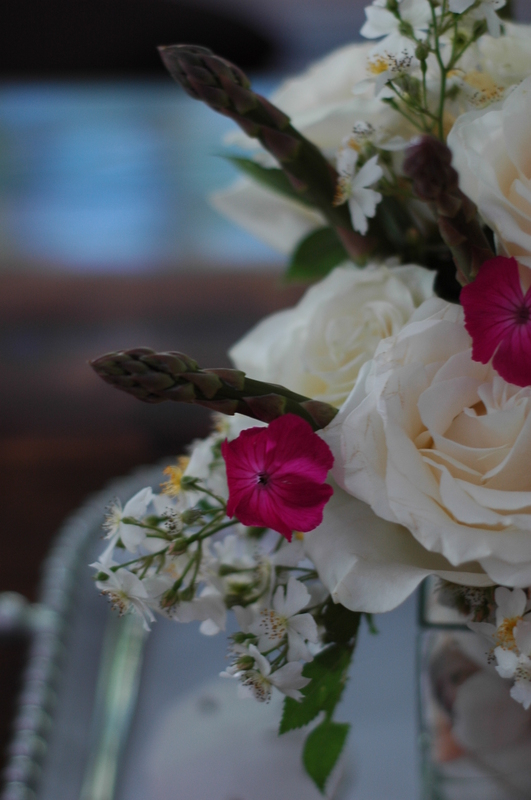 Then I arranged flowers (a combination of grocery store roses, flowers from my yard and wild flowers) around the asparagus. 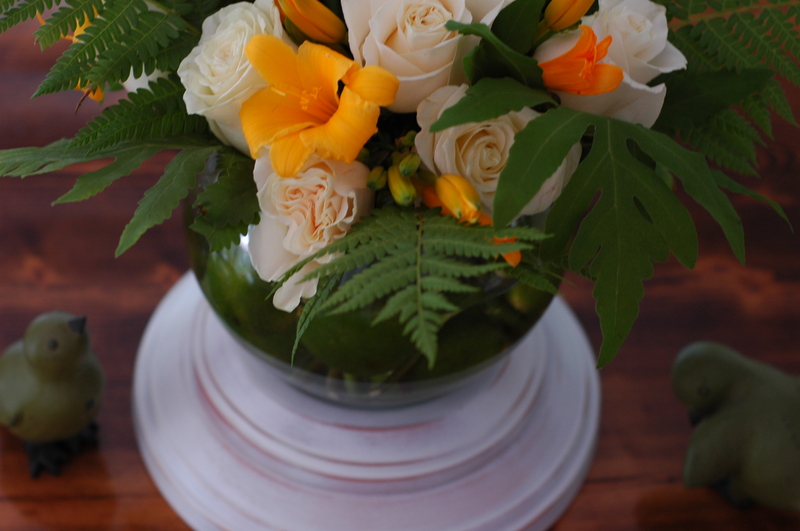 For this flower arrangement, I combined white roses that I bought from my local grocery store with day lilies and 2 types of ferns from my yard. 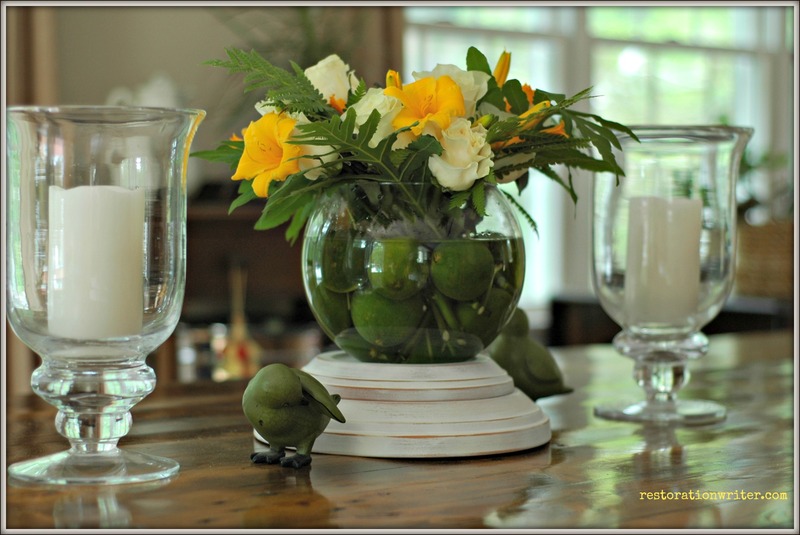 I found a bag of limes at the grocery store for $1.99 which is a bargain with this year’s lime shortage and decided they would work great in the globe vase of my flower arrangement. To add some height to the arrangement, I spray painted 2 different size terracotta pot coasters with white paint and then distressed them. 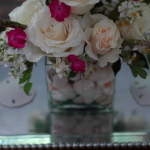 I turned them upside down to form a riser for the flower arrangement. 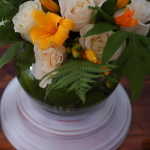 One thing to note with this arrangement if you plan to use the same elements, both the ferns and the day lilies won’t stick around for long so be sure to pull this flower arrangement together the day of your party. Last but not least, peonies! 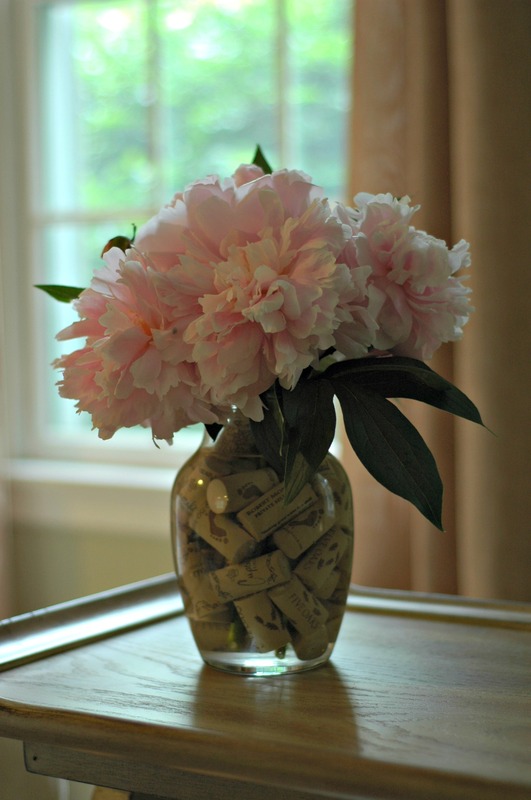 Just like so many others, peonies are one of my all-time favorites. 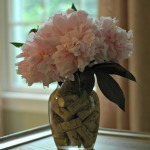 Peonies are a show stealer so it’s best to display them solo. To add a bit of flair, I put a bunch of synthetic wine corks (I was concerned that traditional corks would absorb too much water) in the vase. Starting to see the theme with my flower arrangements? 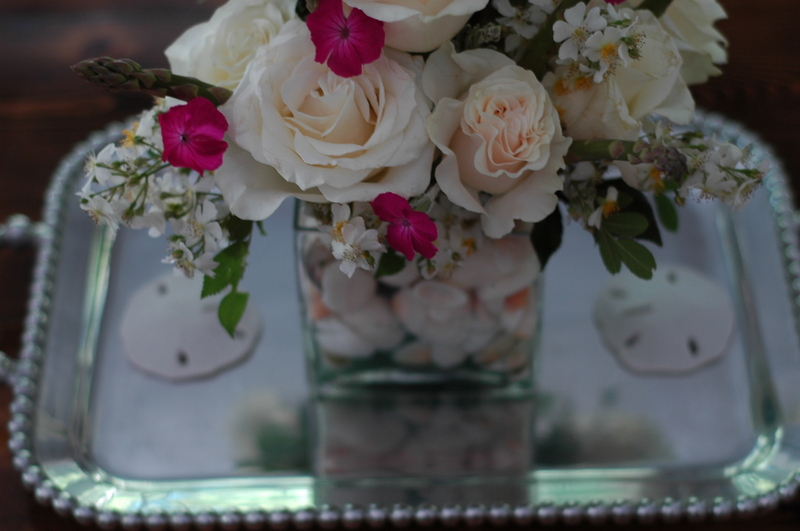 I love adding elements of surprise to the vases! The water practically begs to have something added to it. Which addition do you like best?